The Kobolian ark, which has saved the lives of Apollo's 800 left-behind contingent of humanity, now brings death. References in the book place it immediately after the events of Destiny. 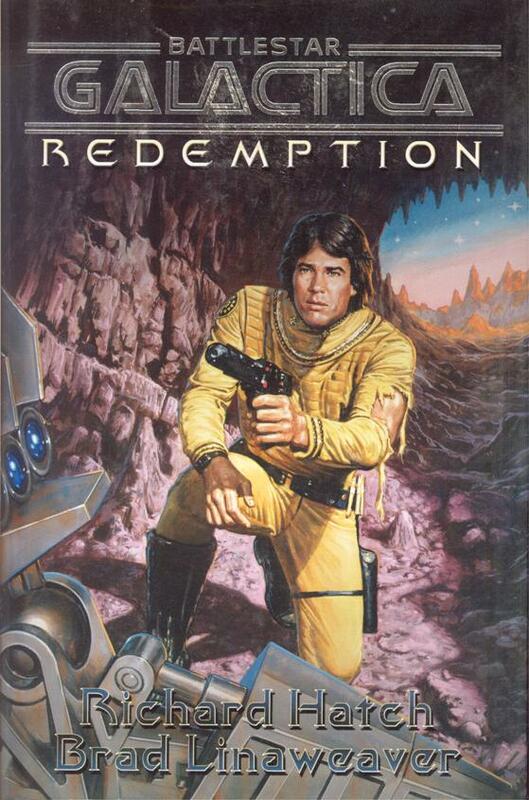 This, the seventh book in Richard Hatch's continuation novels of the original BSG, ends on a cliffhanger and was intended to be continued in an eighth book in the series which has reportedly been written but never published. Some arguments over publishing rights arose, resulting in the loss of licensing for BSG by Ibooks. It is uncertain whether the eighth book will ever be published. This final book (so far) of the Hatch series continues the infuriatingly annoying habit of retroactively changing plot details of past books. For example, each book seems to jump the timeline of the story farther into the future even though the story picks up immediately after the previous novel! In Paradis, Cassiopeia's son is just born. Then in Destiny, he seems to have the attributes of being at least a toddler (usually a child 1-2.5 years of age). Now, as this book opens immediately after the events of Destiny, the boy is described as 5 years old! The cover of the novel seems to have nothing to do with the storyline of the book. Maybe the cover painting is actually based on the events of the already-written but never-published follow-up novel? It shows Apollo wearing a torn uniform in a cave, brandishing his weapon at some kind of mechanical construct; no such scene occurs in this novel. Page 1 indicates that Cassiopeia's son is 5 years old, so this story opens about 5 years after the events of Paradis, when he was born (of course, see the note in the Didja Know section above pointing out that the timeline of these novels keeps changing retroactively). I'm not even going to bother pointing out that it should be "yahrens", not "years". On page 4, Apollo seems to refer to Earth as the original world. But Earth is only another colony of humans, which originally arose on the planet Parnassus according to the events of Armageddon. This fallacy is also repeated among Imperious Leader's thoughts on page 38. On page 6, Athena thinks to herself that she is more like Commander Cain than she is her own father, Adama. On page 7, Tigh uses the phrase "Land of Nod" while telling Athena she needs to get some sleep. It seems out of place for a Colonial to use the phrase, as its origin on Earth as a reference to the world of sleep is a play on the Biblical Land of Nod, east of Eden, to which the Biblical Cain flees after murdering his brother, Abel. This book continues the tradition of confusing the roles of Drs. Salik and Wilker. Dr. Salik (Wilker) makes references to the fleet's radscanners, able to detect all kinds of energy and radiation. The Cylon centurion who survived the explosion of the Imperious Leader's baseship and is left floating in space is said to be one of the new centurions with a reptilian brain. But earlier novels have stated that most of the centurions were reptilian, and it was just that some entirely robotic ones were created as well when troops were running low in the war against humanity. Page 12 seems to suggest that there was peace with the Cylons when Starbuck was training as a Viper pilot, before the betrayal at the Battle of Cimtar still in the future. The author seems to be confusing the phony peace treaty in "Annihilation" as some long term treaty that was already in place. Also, during Sheba's flashback to her youthful training days, she reminisces on the Council's promise of generations of peace in the Colonies. Page 13 reveals that Starbuck's first sexual experience was with a socialator aboard a space hotel. Page 26 reveals that Sheba began her Warrior training when she was 15 yahrens old. On page 29, the CO of young Sheba's training class uses the term "slagger". According to the Hatch glossary, a slagger is a slothful person. Aboard the derelict Cylon basestar on page 31, Boomer shows his skill with electronics, as he did in episodes of the TV series such as "Fire in Space" and "The Hand of God". Page 35, suggests a reason that Imperious Leader was willing to keep Baltar alive for so long. Imperious Leader had determined that Baltar had a way of sizing up problems and a propensity for sharing his thoughts with anyone who would listen. The Cylon leader considered it a crime to eliminate such a valuable resource. Page 37 gives a reason why Baltar was willing to side with the Cylons for a phony peace treaty and betrayal of humanity. He had determined that Cylon victory was inevitable and it was better that certain members of the human species were allowed to survive after the defeat than to have all humanity wiped out of the universe. Page 38 suggests that Imperious Leader considers Apollo to be the most unpredictable of all humans in Cylon experience. Also on page 38, Imperious Leader reflects on the new Cylons intention to combine human DNA with that of Cylons in their biotech experiments. But according to previous novels in the series, that was already done long ago by Count Iblis when he was modifying the original Cylon species to be the perfect warriors. Seeing her constantly washing her hands, on page 38 nurse Elayna remarks that her assistant, Vesil, is germaphobic. The actual term for someone with an obsessive-compulsive fear of germs is mysophobic. Page 43 reveals that the blood of reptilian Cylons is purple. On page 46, Apollo remarks on the time when his father disagreed with Commander Cain on using both their battlestars to go up against three Cylon basestars. This is a reference to "The Living Legend" Part 2. On page 51, Apollo remarks that he never looks a gift daggit in the mouth. This is a twist on our own English expression of "don't look a gift horse in the mouth." In Rebellion, Starbuck uses the pharase, "don't look a gift Boray in the mouth". On page 51, the Colonials discover a cache of Cylon weapons aboard the derelict basestar: zap lasers that discharge electricity, disrupters that tune electromagnetic force into a wave that vibrates a living target to death, and hand guns that emit sonic waves. On page 61, Caran refers to the basestar as a Cylon space oyster. The basestars do look vaguely like the opened shell of bivalve molluscs. Page 72 implies the fleet will spend a month or more travelling through hyperspace to get to the next habitable system, about 3 light-years from the Paradis system, possibly running out of food stores before arrival. This is the first indication we get of the amount of time it takes to travel with Colonial hyperlight drives. Fine, as far as it goes. But what happened to the QSE drives supposedly installed for all ships in the fleet in Resurrection? Even if the tear-down and rebuild of some ships in Paradis resulted in the loss of QSE for some ships, what's to prevent the Galactica or others from attaining the new planetary system and bringing back food for the rest? On page 81, Aardema remarks that it would be a cruel irony if the Cylons could lose the battle, but kill humanity with a disease. In the deleted scenes of "Exodus", it is revealed that Serina and many other refugees were infected by a bio-agent in the bombs dropped on the Colonies by the Cylons in "Annihilation". Aboard the Kobolian ark, the Colonials find the hibernating forms of several humans of the Thirteenth Tribe, which they decide to awaken. This is very similar to the events of the War of Eden mini-series from Maximum Press. Page 87 reveals that the Cylons created cloned duplicates of Baltar's brain. Page 167 reveals that the human brain which is part of the Cylon organic computer aboard the derelict baseship is also a duplicate of Baltar's. Being dead, Baltar realizes he might now be able to view the past and future besides just the present. Page 94 reveals that there are now civilians living on the battlestars beside the military, to limit the numbers that had to be left behind in Destiny. Page 95 reveals that Dr. Salik (Wilker) has been reassigned to the Daedalus, to work as Athena's resident genius. Discussing the fleet's food shortage, Tigh remarks to Athena that he wishes there'd be a cosmic mealprep floating in space between the fleet and its destination. According to the Hatch glossary, a mealprep is a kitchen. Page 98 reveals that several civilian ships of the fleet have been converted to medical ships to house and care for the sickest individuals since leaving Paradis. One of these ships is called the Gardener. On page 105, Elayna's correction of Apollo is stated twice in a row; an obvious miss in the editing of the book. Page 105 reveals that the ark has one person in a cryonic freeze pod and several others in more sophisticated hibe (hibernation) pods. Page 109 reveals that Cassie has tried to give her son a name several times, but he always refuses to answer to anything she has chosen. On page 163, Starbuck suggests calling him Apollo, Jr! Page 112 contains the following sentence: "What we have here," Bojay slowly drawled, "is a success at communication." This is a reference to the opposite quote, also spoken in a drawl, by actor Strother Martin in the 1967 classic film Cool Hand Luke: "What we've got here is failure to communicate." Page 116 reveals that Commander Athena ordered the destruction of the Gardener and the deaths of everyone on board in order to reduce the number of people that needed to be fed in the fleet, what with the shortage of food. On page 120, the ill Sheba remarks that she hasn't had a cold in a long time and Apollo tells her to get plenty of coneth stew. This is probably the Colonial version of our own reference to the common folk remedy of eating chicken soup to fight off cold and flu. On page 123, Baltar thinks of himself as both a traitor and a hero, trailing Promethean fire in his wake. This is a reference to the Greek mythological figure of Prometheus, one of the Titans, who betrayed his fellow gods and gave fire to humanity, making him a traitor to the Titans and a cultural hero to humanity. Pages 123-124 present Bojay as becoming almost a super-heroic character. By day he repairs Vipers and mentors some of the young Warrior cadets. During sleep shifts, he roams the corridors of the Galactica seeking the most incorrigible of youths to be rejuvenated as contributing members of fleet society, using superior fighting skills to take down young punks who oppose him with violence, often earning their respect in the process. Later, Bojay is seriously injured rescuing two cadets from a fire in the landing bay. On pages 128-129, Apollo muses on Baltar's accomplishment of communicating with him from beyond the grave as equal to the Gamon reaching him after the destruction of their home planet Paradis. But I don't recall any instance of the Gamon having done so after their apparent deaths in the destruction of the planet in this or the previous novel! On page 134, the phrase "I was one of a select view" is used instead of what was meant, "I was one of a select few." Page 138 reveals that Troy is cheating on Dalton with Rhaya. In paragraph 8 of page 143, Cassie is referred to as Connie! On page 149, Boomer speaks of an old summer house he had, which suffered from some infestations of crawlons and flanchettes. "Crawlon" is the Colonial term for "spider" and a flanchette, according to the Hatch glossary, is a stinging insect. Probably the term "flanchette" was derived from the English word "flechette", which is a steel, dart-like projectile. Page 150 refers to the death of Apollo's brother, Zac, as the first death of the Cylon War. Uh, no. Again, the author is erroneously thinking that humans and Cylons were at peace before the Battle of Cimtar in "Annihilation". Page 167 suggests that a number of cloned Baltar brains are in use around the Cylon Empire. Page 173 suggests that Trays had admired Dalton from afar. I wouldn't really call it "from afar" considering the two were dating when Dalton was feeling critical of Troy's love in Resurrection. On page 178, one of the Noman-like survivors on the Kobolian ark seems to suggest that his kind are Borellian Nomen. But Armageddon describes the Nomen, led by Borellus, as having arrived on Caprica millennia ahead of the exodus from Kobol and evolving into their current state on Caprica. So their should have been no Nomen to board to ark on Kobol in the first place. On page 180, Baltar uses the phrase "as crazy as a Cylon hairdresser." I wonder if this is a reference to the afro-like conglomeration of hair or wiring on top of Imperious Leader's head! Page 181 reveals that the plague which struck the Kobolians thousands of years ago, as seen in this novel, was created by Count Iblis. He also created a cure, which is found aboard the Cylon basestar thanks to information from Baltar. On page 182, Baltar remarks, about Count Iblis' desires, "To truly be God, you need to create ex nihilo," to which Apollo responds, "Out of nothing." Ex nihilo is Latin for "out of nothing". Where do the split groups of Colonials go from here? What will be the outcome of the Cylon civil war? Will Cassie's son turn evil? As mentioned above, the eighth novel has never been published, so we may never find out.